Canker sores, known medically as aphthous ulcers, are fairly common among people. Lasting for about a week or so, these mouth sores are usually more irritating than painful. But about a quarter of the population, especially women, frequently suffer from an acute form that doesn't often respond well to over-the-counter remedies. A typical canker sore is usually round with a yellow-gray center ringed by a reddened "halo." They can be preceded by tingling or painful sensations at the site a few hours or so before breaking out. Recurrent aphthous stomatitis (RAS) is the more severe form of canker sore, often with outbreaks of multiple painful sores. While the more common sore is usually less than a centimeter in diameter, RAS sores are often much larger. Canker sores often arise during periods of stress or anxiety, and seem to be connected with eating certain acidic foods like tomato sauce, citrus fruits or spicy dishes. RAS also seems to be related to underlying systemic conditions like vitamin deficiencies, anemia or digestive disorders. Besides managing diet and stress, people with regular canker sores and milder cases of RAS can often find relief with non-prescription numbing agents often found in stores and pharmacies. For more severe RAS, though, you may need the help of your dentist or physician with treatments like prescription steroids or other medications that come in gel or rinse form or through injections. The goal of any treatment approach is to decrease pain severity and shorten healing times after an outbreak. While most mouth sores, including RAS, aren't dangerous to your health, you should still take any sore seriously. You should especially seek medical evaluation if a sore doesn't heal after a couple of weeks, if they seem to come more frequently and are more severe, or if you don't seem to ever be without a sore in your mouth. These could indicate a serious underlying problem that needs to be addressed. One thing's for sure: there are ways to ease your suffering if you have frequent bouts with regular canker sores or even RAS. Talk to your dentist about ways to minimize your discomfort from these irritating mouth sores. Do you ever get sores in your mouth that seem to appear for no reason and then disappear just as mysteriously? 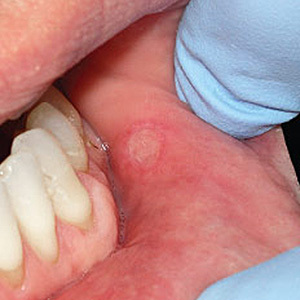 Chances are they’re aphthous ulcers — better known as canker sores. These are irritating breaks in the protective lining of the mouth (oral mucosa) — akin to a blister without its dome — that are yellowish/grayish in the center surrounded by an aggravated red border. They typically develop in movable, thinner oral membranes such as the cheeks and lips, under the tongue, or the soft palate at the back of the mouth. Because they expose underlying tissues, canker sores can be quite painful, especially when eating or drinking. Recurrent aphthous ulcers (RAS) affect up to 25% of the population, making them one the most common oral conditions. They are considered “minor” when they are smaller and “major” when they exceed 1 centimeter in diameter. Larger ones take more time to heal and may cause scarring. A less common type is herpetiform aphthae, so named because the small clusters of ulcers that characterize it are similar in appearance to those caused by the herpes simplex virus (HSV1). However, unlike herpes-related cold sores and fever blisters, canker sores in any form are not contagious. Another difference is that ulcers from the herpes virus occur more frequently on the gums and hard palate. There is no clear cause for canker sores. They often appear during stressful periods and times when resistance is down, suggesting an immune system malfunction. They may also be an allergic reaction to ingredients in food or oral products like toothpaste or mouthwash or related to an underlying medical conditions such as gastrointestinal diseases or nutritional deficiencies. Canker sores usually resolve on their own within seven to ten days. Various over-the-counter and prescription treatments can help facilitate healing and help minimize pain along the way. If they do not resolve within two weeks; or they increase in severity, frequency or duration; or you’re never without a mouth sore it’s important to seek dental or medical attention as they could signify a more serious condition.